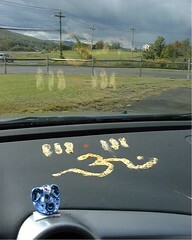 Follow Hindu, Christian, Sikh, Islamic and National Holidays of India and America here! Click on some images to see a bigger size or be directed to a different site. This is the first day of the Tamil Calendar akin to the Western January 1st New Year. However, according to the Western Calendar, Tamil New Year starts on April 14, spring time. More on Tamil New Year here. Very few dates of Hindu festivals happen on the same time every year, especially when related to the Western Calendar. Tamil New Year always falls on April 14. This is typically a Jain holiday. However, Hindus also celebrate this day. The main ritual done on this day is to buy new gold or silver jewels. It is considered auspicious to buy and wear new jewelry on this day. 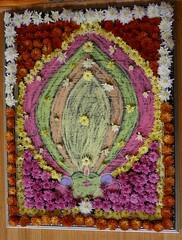 The design made of flowers is called POOKALAM (Poo- flowers, Kalam- design). The design is of a Kathakali dancer's head dress. Kathakali is the classical dance of Kerala. The Pookalam was designed by the author of this site. Click on the photo to see a bigger version. Journal entries on Onam, including our Sadhya (feast) details and cultural celebration where I dance Thiruvathirakali, Kerala dance (youtube video included). Rakhi, or Raksha Bandhan is a festival that originated in North India, but the younger generation celebrates this in Chennai. Girls and Women pray for the welfare of their brothers during this festival. They symbolically demonstrate this by tying a thread with or without trinkets on it on their brother’s hand. The girl can tie the Rakhi on a blood brother, a cousin brother or a close friend that is a male. If a boy has a Rakhi tied on him it means two things, one is that he must protect the girl and, two, the girl is a sister to him, and, due to that, should not think of marrying this girl. Hence, during this time, guys try to avoid girls tying Rakhi on them at any cost. It is noted that any one receiving a Rakhi returns the favor. Whoever tied the Rakhi on the boy, must receive a ‘thank you gift’ from the boy. This can include a small present or money. Read the story of Krishna Jayanthi here. 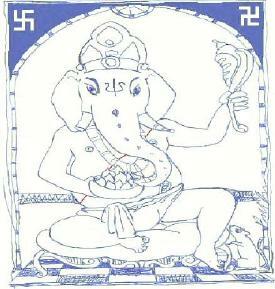 2008 Ganesh Chathurthi Celebrations at Hamlin Beach, NY, USA. Fall Navarathri usually falls a day after the new moon in Puratasi month, which is September-October month in the Western calendar. Nava means nine and rathri means night, hence this festival lasts nine nights. 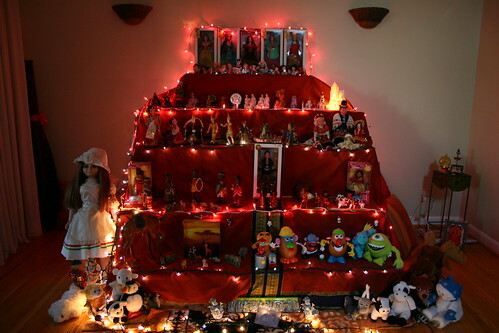 Add your Golu/ Dolls displays/Hina Matsuri photos to my flickr group! Click here. Day 1: Dhanteras – Goddess Lakshmi is worshipped on this day. Dhan means wealth, and one form of Lakshmi is Dhannalakshmi. Many businesses in India use this day as their financial new year, or audit time. People decorate their homes with plants, colorful kolums, floor designs, and burn oil lamps all day and night. Day 2: Choti Diwali- On this day, Lord Krishna had killed an evil demon king. After the battle, Krishna returned before sunrise to bathe. 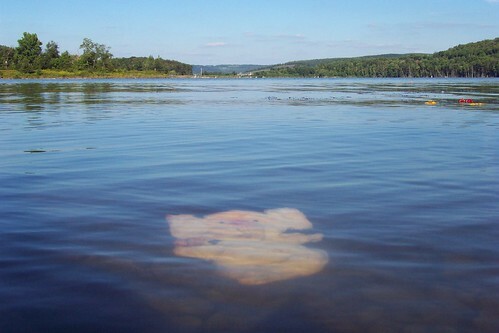 He was given bath in scented oils. It is tradition on this day to have an oil bath on the entire body and hair also. People prepared scented oil from different oils. I was aware of using sesame oil and some additional spices. After taking oil bath, one takes some shikakai or other herbal mixed powders to rub the oil off. These powders soak up the oil and also exfoliate the skin, leaving it with a healthy glow. People also elect to take a bath with soap and water after this as well. Day 4: Padwa- This marks the coronation of King Vikramaditya and Vikaram-Samvat. Hence Diwali, if treated as a new year, is called Vikram New Year. Day 5: Bhayya Dhuj – This is the day that Brothers visit their sister’s homes and sister’s pray for their brother’s welfare. It is also on this day, brothers give their sisters gifts. These five days are explained in more detail on this page. This festival is widely known only in Tamil Nadu. It is the festival that ends the end of the festival season. Karthigai is the name of the month, and deepam means light. Though Diwali is known over India for being the festival of lights, Karthigai Deepam is truly the Tamil festival of lights. Some begin burning oil lamps throughout Diwali and until this festival. Temples are full of small oil lamps; you must be careful where you step! The number of oil lamps, sizes, shapes and smells of burning oils and butters is a fabulous experience for your eyes and nose! Many burn oil in a five wicked deepam, each wick stands for elements of a successful life- health, wealth, learning, courage and longevity. This festival is famous in the town of Thiruvanmallai in Tamil Nadu. On this day, they ignite a flame that can be seen for 35 kilometers. This flame is powered by 1,000 kilos of ghee and 350 meters of wicks in a cauldron ten feet high and five feet in diameter. During the night devotees can climb the hill to offer ghee to this fire. As this fire is large and extremely hot, the ghee is fed into the fire through a ten foot tube. Many also note that walking around this hill is good for health as many medicinal plants grow there. It is noted that as this festival falls near the winter equinox, the days are very short at this time of year and the lit oil lamps brighten up the night in a grand way. Bhogi day falls on the last day of Margazhi month. On this day, spring cleaning is done from top of the house to bottom. In villages it is a grand scene. Those living in mud huts will clean the outermost layer of mud off their walls and replace with mud and smeared cow dung. It is said the cow dung has medicinal properties. And against most belief, there is no adverse smell from this process. Also, the grounds in front of the home are dug up and removed and resurfaced. Families like to purchase new implements for their home, and on this day they are installed. For example, my friend’s family I stayed with in the village installed a ceiling fan on this day. Bhogi, and all Pongal festivals fall on the same date in the Western calendar every year. These fall in the tenth month of the Tamil calendar. Interestingly, Pongal is the equivalent of American Thanksgiving, which also falls in the 10th month, November. The three days of Pongal are a grand sight in the villages of Tamil Nadu. Though city folk will celebrate Pongal, it being a harvest festival, the real fun is in the village. Other articles of interest: Pongal Recipe | More articles on Pongal by Jayanthi. The 14th day of the dark half of every month is called 'Sivaratri''. The one in the month of Maasi (February-March) is known as 'Mahasivaratri'. Of all the major Hindu festivals, Mahasivaratri is the only one that is more a serious affair. There is practically no festivity, revelry or gaiety in its observance, the whole thing being one of continuous solemnity. This vrata or penance is open to all human beings. The basic disciplines to be kept up on this day are ahimsa (non-injury), satya (speaking the truth), Brahmacharya (continence), daya (compassion), Ksama (forgiveness) and anasuyata (absence of jealousy). On Mahasivarathri night all fast and stay up all night praying to Lord Siva. 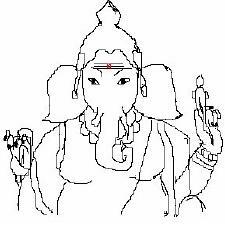 On this night, it is considered auspicious to do abhishekham to Lord Siva. That means bathing him with milk, honey, water, and nectars. Devotees stay up all night and as they do abhishekham, they also sing bhajans, or religious songs, chant mantras, and participate in homa, or fire worship. It is also said that on this night, Lord Siva and his wife Parvathi ride around the earth on their bull, Nandi. If devotees continuously repeat a wish of theirs, if Siva, Parvathi and Nandi hear it on their way by, they will grant your wish. In fact, this is incorporated into some Siva rathri rituals as devotees whisper a wish into the statue or murthi of Nandi. More about Holi on my site, submitted by Ajoy. Eco-Friendly Holi Great site all about Holi! Ugadi is the New Year for the Telugus, the people of Andhra Pradesh living to the north of Tamil Nadu. Spring Navaratri is the nine days in the year dedicated to the goddess and welcoming in the spring weather. 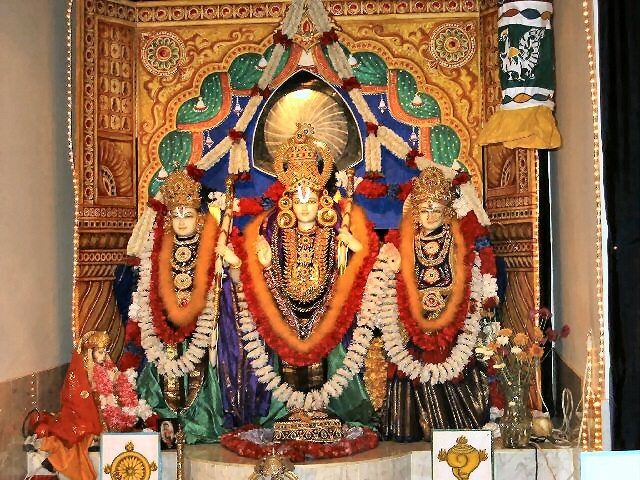 It is also, again, during this time, Lord Rama is worshipped, as at the end of Navaratri is Rama Navami, or Lord Rama’s birthday. It is during these nine nights devotes of Lord Rama recite the Ramayana. Ramanavami is the birthday of Lord Rama. Navami means the ninth night. This day is celebrated as the ninth and last night of the spring Navarathri, the nine nights of spring. Lord Rama is the beloved brother of Lakshman and husband of Sita. On this day, devotees will read the Ramayana, the epic story that depicts Lord Rama's life. On this day, people also sing bhajans to Lord Rama and/or attend music festivals. During this time of year, people prepare to perform or watch Tyagaraja compositions. Saint Tyagaraja was a South Indian music virtuoso who was a devotee of Lord Rama, and his compositions are revered during this time of year. This page has been visited times since it's inception in August 2005. Updated Oct. 2006. Updated January 2008. Updated October 2008.